After managing to track down 19 of his old classmates last year, Mr John Hill was persuaded to be the speaker at this year's Soham Old Grammarians' reunion dinner on Saturday. 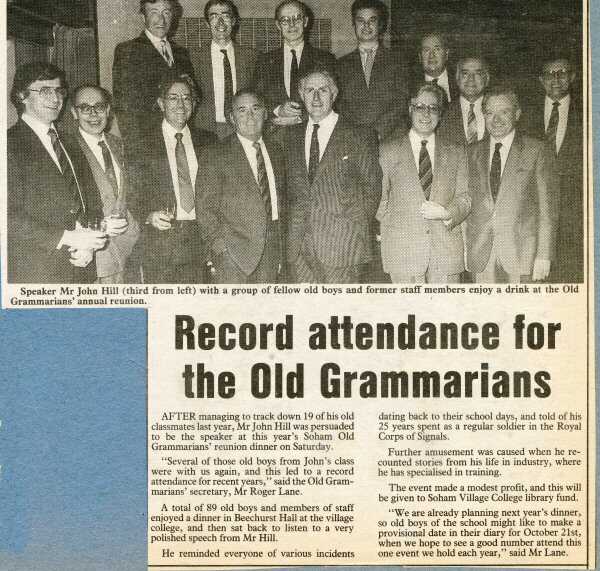 "Several of those old boys from John's class were with us again, and this led to a record attendance for recent years," said the Old Grammarians' secretary, Mr Roger Lane. A total of 89 old boys and members of staff enjoyed a dinner in Beechurst Hall at the village college, and then sat back to listen to a very polished speech from Mr Hill. He reminded everyone of various incidents dating back to their school days, and told of his 25 years spent as a regular soldier in the Royal Corps of Signals. Further amusement was caused when he recounted stories from his life in industry, where he has specialised in training. The event made a modest profit, and this will be given to Soham Village College library fund. "We are already planning next year's dinner, so old boys of the school might like to make a provisional date in their diary for October 21st, when we hope to see a good number attend this one event we hold each year," said Mr Lane. Speaker Mr John Hill (third from left) with a group of fellow old boys and former staff members enjoy a drink a Grammarians' annual reunion. If you can add to this page, in particular name those in the photo, please contact the editor.